Credit cards are one of the most convenient and useful financial tools available—but we all know that sometimes credit cards get abused and we end up running up a lot of debt. Those credit card payments can be a real drag (and can have other detrimental effects), so perhaps you can apply the Snowball Method to help pay that debt down. 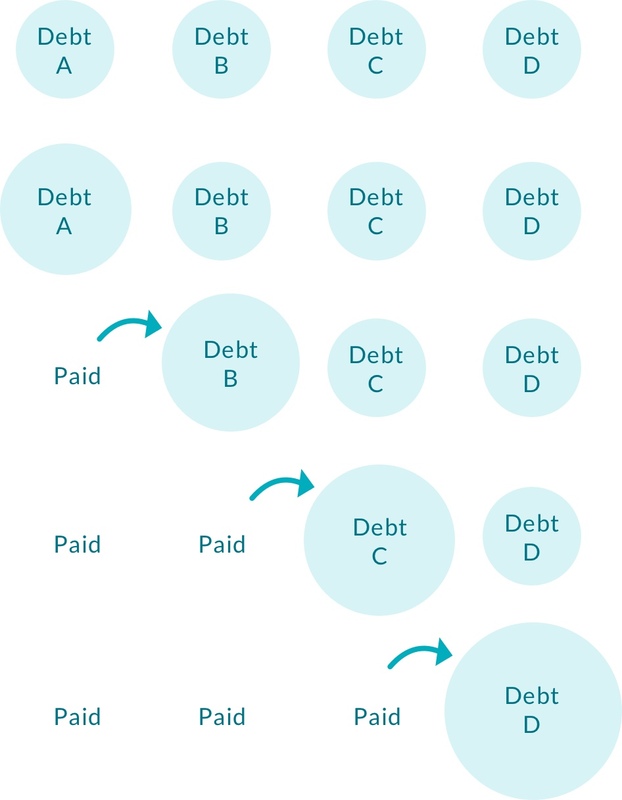 Researchers have found that consumers who pay off small balances first are more likely to eliminate their entire debt than those focusing on other strategies because of the positive feelings you get when you achieve successes early in the process. We’ll be exploring more on the topic of credit cards and credit scores in a future Purse Strings guides, but for now, let’s look at a proven way to begin tackling consumer debt if you’re currently carrying some and want to reduce it. The Snowball Method is a debt payment system that can bring you early, easy successes, building your confidence and motivating you to keep going. Each month Mary has $650 of her income available per month to devote to paying off her debt. This is the amount available after she accounts for her regular expenses such as rent, utilities, groceries, and necessities. Mary does a thorough analysis of her resources (using the tools we’ve introduced in this guide), and finds an extra $60 per month that was “leaking.” In addition, Mary decides to temporarily take on a Saturday childcare job that will pay her an additional $100 per month. She now has a total of $810 per month to attack her debt. The first thing to do with the snowball method is to total up the minimum monthly payments for all obligations – from lowest balance to highest. For Mary the total is $459. Mary will begin the Snowball process by making the monthly minimum payments on all of these obligations. Since Mary started with $810 available to pay toward her debt monthly, she will have $351 left over after all minimum payments are made. ($810 – $459 minimum monthly payments = $351). Mary applies that $351 to Mobile Oil (her lowest total debt) in addition to her $30 minimum. This brings the outstanding balance on that account to $401! She’s already knocked that debt in half! Each month Mary repeats this process. She always applies the extra that remains after paying minimum balances to the FIRST debt on the list. The first debt will be paid off quickly – a great win! The next month, the entire amount left over after paying all minimum payments due amounts are applied to the time at the top of the list. Very soon, items drop off the list and the list of obligations get shorter and shorter. As you can see, the amount of money you have over time starts to snowball, getting bigger and bigger. And as you pay off those debts, you feel better and better! You take the power back and get yourself out of the debt spiral. There are cool apps that can help you manage your money? Try Trim! It watches your accounts for you and let’s you know great info like when your cable bill is overcharging you, if your bank has assessed a fee or what your occurring subscriptions are – and they will take care of canceling anything and getting your money back!